Just a couple of fields away from Mundham St Peter sits the church of St Margaret and St Remigius, Seething. Its north side fronts on to the village street, and other roads flank the east and west of the graveyard, but perhaps the best view is across the meadow from the south. The tower is demonstrably Norman, the upper stage renewed probably in the 19th century. The nave is probably the Norman original, its height extended by those who put in the late medieval windows. Pevsner thought the chancel probably all of an early 14th century piece, except for the Victorian east window. The whole piece is pleasantly massed, its size accentuated by the small graveyard. I will say from the outset that this church deserves to be better known than it is, because what it contains is in several ways extraordinary. Simon Jenkins' book England's Thousand Best Churches has often been criticised by churchcrawlers, but what compromises its credibility most is the way it misses important churches, like Westhall, Redgrave and Sotterley in Suffolk, or this one here at Seething (though it must be said that the book is not as bad as its follow-up, England's Thousand Best Houses, which my local remaindered bookstore is currently having trouble giving away). You step down into the nave from the south door, another medieval survival. The floor internally has been levelled, but the earlier level is still apparent from where the brick steps have been left on the north side. Ahead of you are the famous seven sacrament font, and the late medieval wall paintings of the Three Living And Three Dead, and St Christopher. There are many more wall paintings which we will come to in a moment. But first, the font. For those of you new to this site, seven sacrament fonts are one of the seams of gold that run through churchcrawling the eastern counties. They were created during the second half of the 15th century to try and impress on local yokels the significance of orthodox Catholic doctrine, specifically in this case the seven sacraments of the Catholic church. Norfolk has more than 40 seven sacrament fonts, several of which are almost entirely defaced, like that at nearby Loddon, but some are in remarkably good condition. Pevsner, in the most recent Bill Wilson edition, said of this one that it was an extremely fine Perp piece of c.1480, almost completely undamaged, and that it was well-cut and naturalistic, with a developed sense of perspective. Mortlock, hedging his bets a little, thought it fine and well-preserved. Back in the 1930s, Cautley noted that it differed in detail from some of the others, which is grammatically sloppy at the very least - did he mean it didn't differ in detail from the rest? M R James in the 1920s obviously came in a bad mood, because he thought it so recut as to be without interest. The panels of the font are fascinating, because the composition of some is most unusual - the Last Rites panel, for example, which unusually faces east, places the dying man on a high pedestal, with an apparently miniature Priest standing on the bed which appears to be empty. The Confession panel, more damaged than the others, shows the sacrament taking place in a shriving pew, which is in itself not unusual; but the angel appears to be being held by two watching Ministers. Perhaps most curious of all is the Mass panel, which is depicted from behind, the Priest with a large cross on his vestments, a cross on the large host he elevates, and the two acolytes apparently standing on the altar. The eighth scene is the Baptism of Christ. Each scene is set on a little dias, and is set deep into the panel of the bowl. 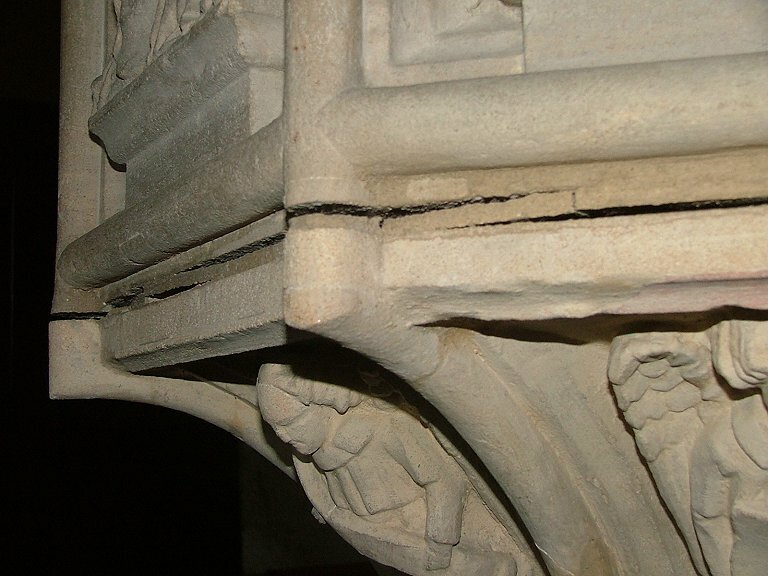 Perhaps this is what led Pevsner's editor to think it might have been undamaged; perhaps he thought it might have been cemented over in the 16th century. But to my eye, and to that of other people I have shown the panels to, Pevsner (or Bill Wilson) is wrong, and M R James is right. It seems to me that the font is almost entirely recut, and to such an extent that there is no guarantee that what it shows now has anything to do with what was there before. Further, the whole piece is clearly a composite, and the cement that glued the bowl on to the stem is now cracking and coming away. The stone at the top of the stem is a quite different colour to the stone of the bowl, and probably they came from different fonts. If you look at the font at Sloley, and the one at nearby Brooke, the style of the three seems very similar. There are three possibilities: the font at Seething was from the same workshop as the Sloley and Brooke fonts, and has been recut to look like it did originally; the font is a recut seven sacrament font, but so much had been destroyed that the recutter based the renewed font on a mixture of imagination and what survived at Sloley and Brooke; or, thirdly, the whole thing is a clever fake, a pseudo-medieval confection. I tend towards the second of the two myself; the Mass panel is clearly a fake, but the Confirmation panel is convincing. The Priest in the Baptism panel, however, is a modern invention - he signs the child on the forehead instead of holding him in an attitude for total immersion, and has a beard like Santa Claus. Looking closely, you can see that the figure has been replaced from the waist up, so I think on balance this was a seven sacrament font to start with. The adult males on the Matrimony panel are similarly bearded. Onto the wall paintings, which will, I am afraid, beg more questions. On the north wall they are The Three Living And TheThree Dead, St Christopher, a Joys of Mary sequence and a bearded Saint. 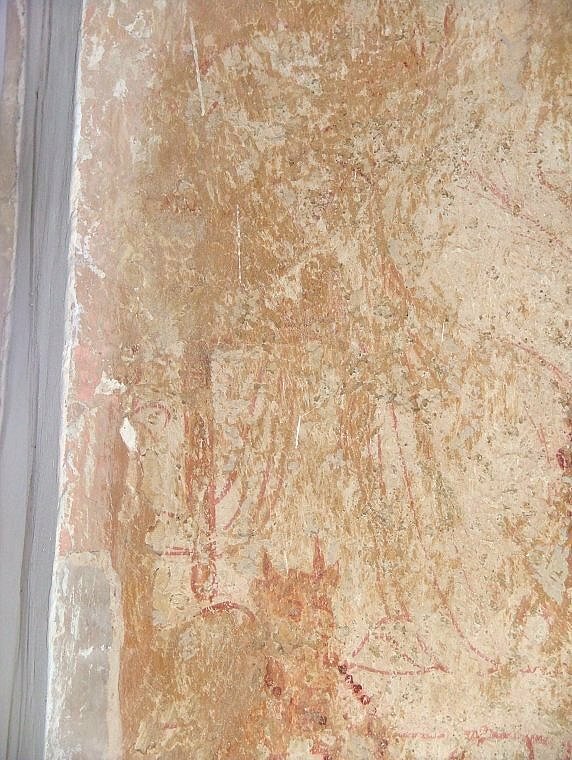 On the south wall are The Warning Against Gossip, an angel musician and a large expanse of painting that I was unable to decode. The north side then. The Three Living And Three Dead is a fine example. The story is that three Princes out hunting come across three wandering corpses in varying stages of decay. The composition is a warning against the inevitability of death; the corpses warn the Princes as they enjoy their earthly pleasures that 'as you are so once were we, as we are so shall you be, so be prepared to follow me'. A delightful little detail is the hare that escapes under the feet of the Princes as they look on in horror. Two of the corpses have been lost because of a 19th century window punched through them. To the east of the Princes is a large St Christopher, who stands gaitered in the water. 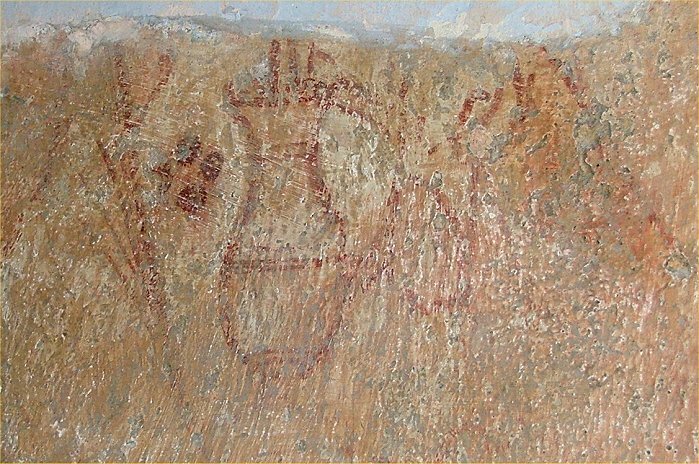 The wall paintings probably date from the late 14th century, and were popular subjects in those years of successive plagues. We tend to associate St Christopher with travellers nowadays, but in the medieval mind he was a comfort in time of pestilence. Anyone who invoked him could be reasonably sure they would not die in a state of mortal sin (it should be noted that he didn't promise to keep the plague away, rather to defend against its most appalling side-effect). This is why images of St Christopher appear on walls at a time when many painted images of Saints were being destroyed, to be replaced by sequences illustrating the teachings of the Catholic Church. However, there is something I find intriguing about the St Christopher here. The Christchild sits in the Saint's arms rather than on his shoulder, and in his hand appears to carry an orb. This is not in itself unique - the Christchild on the St Christopher at nearby Thurton also carries an orb - but the position of the child in relation to the head of the Saint is most unusual - with his right hand he reaches up to touch, even stroke, the Saint's head. And look at the head - it wears what is apparently a female headress, and the flowing tracery of the gown cannot disguise the fact that the Saint's right hand, holding the staff in the traditional manner, is awkwardly positioned in relation to the rest of the body. Could it be that what we are looking at is a virgin and child that has been adapted into a St Christopher? Or even the opposite? Further east, a sequence consisting of five frames is set between two windows. There may have once been further panels above. Two of the panels, III and IV, are very easy to decode. III is the Resurrection, Christ rising from the grave while an angel looks on. IV is the Ascension, with two feet disappearing into a cloud as the Disciples look up. Although very unusual in wall paintings, the composition is familiar enough from 15th century glass. Panel V shows the Coronation of the Queen of Heaven, a reference to an event foretold in the Book of the Apocalypse. 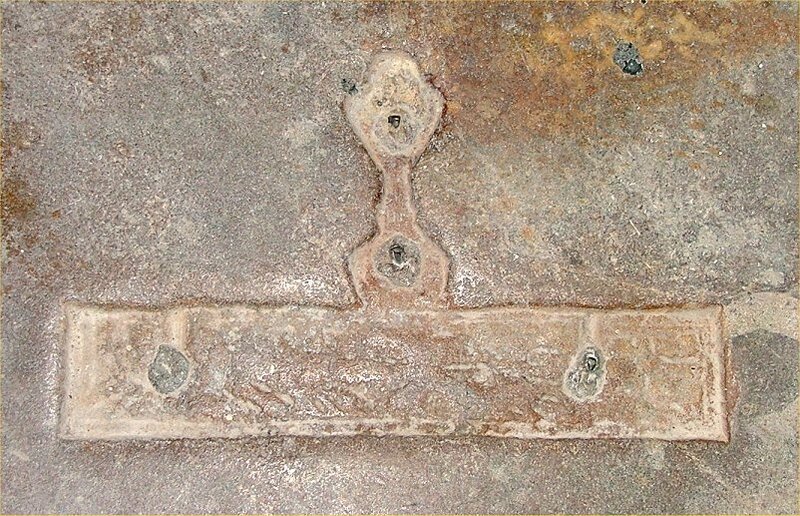 Panel II is unclear; it appears to show the shape of a cross, and has been referred to as the crucifixion. However, if it is a cross then it is an empty one, and so it would have to be the deposition, the body of Christ taken down and held by his mother in front of onlookers, which would explain the seated figures to left and right. Now, Pevsner refers to panel II as the Nativity. Before anyone scoffs too loudly, it is worth looking at panel I. 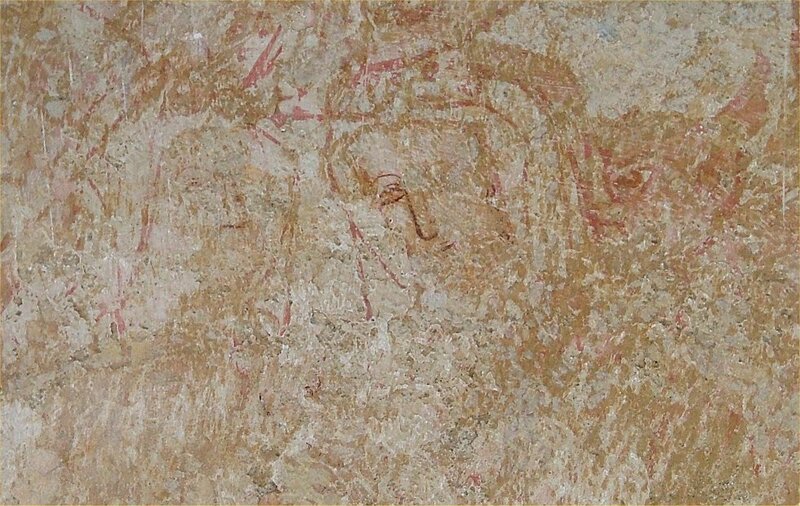 This is almost completely destroyed, but there is a small vase evident in the middle at the bottom, very like that which often contains lilies in an Anunciation scene. If this were so, it would give some validity to Pevsner, and the cross could be interpreted as the structure of the stable. It may seem a curious jump in sequence from the Nativity to the Resurrection. In fact, what we have here is almost certainly a common 14th century rosary sequence of the Five Joys of the Virgin - Annunciation, Nativity, Resurrection, Ascension and the Coronation of the Queen of Heaven. Across the church from the Joys of Mary sequence we find perhaps the most interesting painting of all. This is the rare Warning Against Idle Gossip, the first one I'd come across in Norfolk. 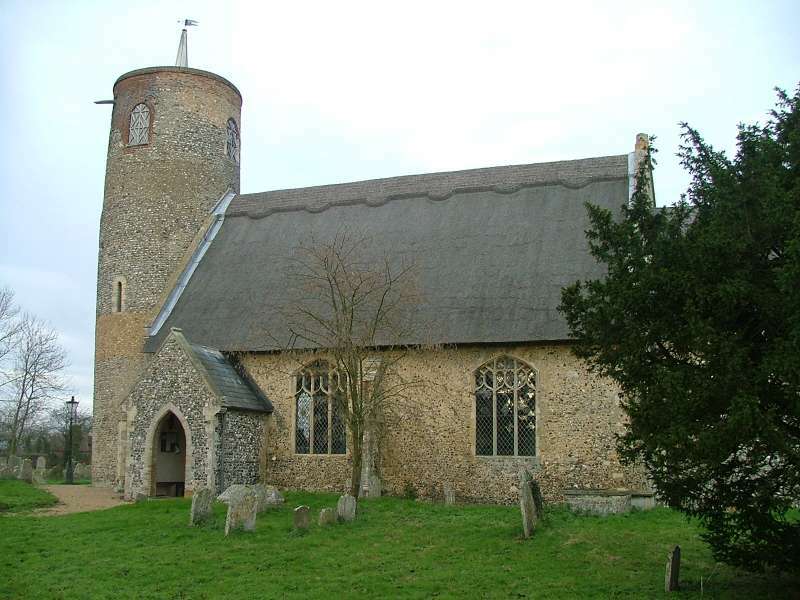 Suffolk has it twice, but I am told it is also in Norfolk at Little Melton. Basically, the composition traditionally shows a number of women talking, while a devil writes down what they are saying - presumably, to use it in evidence later against them. The Seething example has a number of further details. Here, the main devil is up at the top, his wings open as he hovers above the heads of the two gossiping women. They are seated naturalistically, the shapes are beautiful. To the right of the women's heads is a second devil; he holds the other end of the banner on which the first devil is writing. 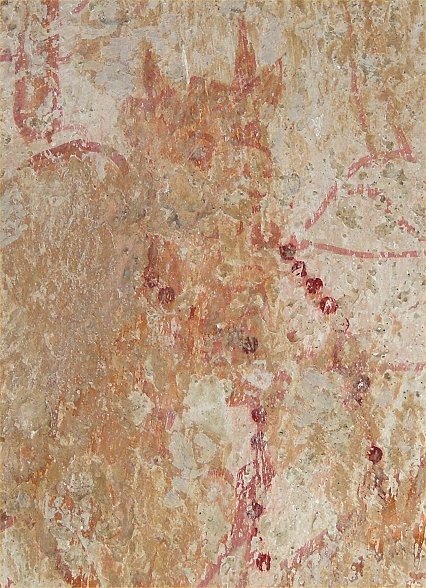 The right hand woman holds a rosary, which hangs down in front of the left hand woman. Her rosary has been stolen by a third devil in the bottom right hand corner, who grins wickedly as he wears it around his neck. Intriguingly, there is a sixth figure standing above and behind him, apparently male and apparently facing out of the picture. I wondered if he might be the donor. The bearded Saint at the east has been identified as St John the Baptist because of his pointing hand. However, he looks rather more to me as if he is leaning on something, possibly a sword, in which case he is St Paul. The angel musician on the south wall is playing a harp. Even without the font and the wall paintings, the church is full of interest. The upper part of the roodscreen is Victorian, but the dado is beautiful, late 15th century and decorated with painted flowers, gessowork and deeply cut raised gilding. There are two roundels of apparently 15th century glass, symbols of St Mark and St Luke, and a composite angel holding a shield in the chancel. If you look closely at the outline of the window, you can see that is made of fragments of medieval glass, some showing drapery and others with the cross-hatching I have come to associate with the Norwich School. DD thought the most interesting thing was the wooden frame in the entrance to the rood stair, which he couldn't remember seeing before (and he has visited thousands of churches). There is an indent for a chalice brass in the chancel, and there are two pre-Reformation brass inscriptions, both asking for prayers for the dead, both unvandalised. One is in the sanctuary, but the other is hidden away under the nave carpet. We carefully lifted this, only to discover that the underlay was made of plastic sheeting. This had caused the damp to collect, and the tiny brass was under half an inch of water. We mopped this up, cleaning off the verdigris, and photographed it, fearing that it is not much longer for this world unless the parish at the very least cuts the plastic underlay away around it. If they haven't done this by my next visit, I will have to do it myself.